If you were to approach Queensland from, say, Alice Springs in the middle of the country, you’d be in for one hell of a surprise. You’d pass through desert. Then forest. Then swampy mangrove for a bit of variety. And then, suddenly, coast. Brilliant, glorious, thriving coast. 4 million people make their home here, where infinite adventure and the world’s greatest natural wonder await. Because, in Queensland, the edge is where life is lived. It’s taken a long time for Australia’s 3rd city to climb out of Sydney’s shadow. Now that it has, it shows no signs of turning back. Find out why Brisbane’s worth a visit. The Great Barrier Reef is only the half of it. Venture into the planet’s oldest rainforest, sail high above the forest canopy and come back to earth for some serious partying. Mangrove swamps and brilliant beaches. Croc spotting and the best sunsets you’ve ever seen. Yup, even better than Blackpool. ‘Sand island’. Sounds desolate. A bit windswept. Hardly paradise. But there’s much more to Fraser Island than sand. From mighty dunes (or blows as they are also known) to mangrove forests, crystal clear waterways and lakes to rainforest, you’ll want to get to know Fraser. The world’s greatest natural wonder, snorkelling experience, and wildlife reserve all rolled into one. Miss it and feel monumentally silly. Scuba diving. Sand yachting. Whale watching. Climbing. Walking. Chilling. Whatever your idea of the perfect escape, it’s here. 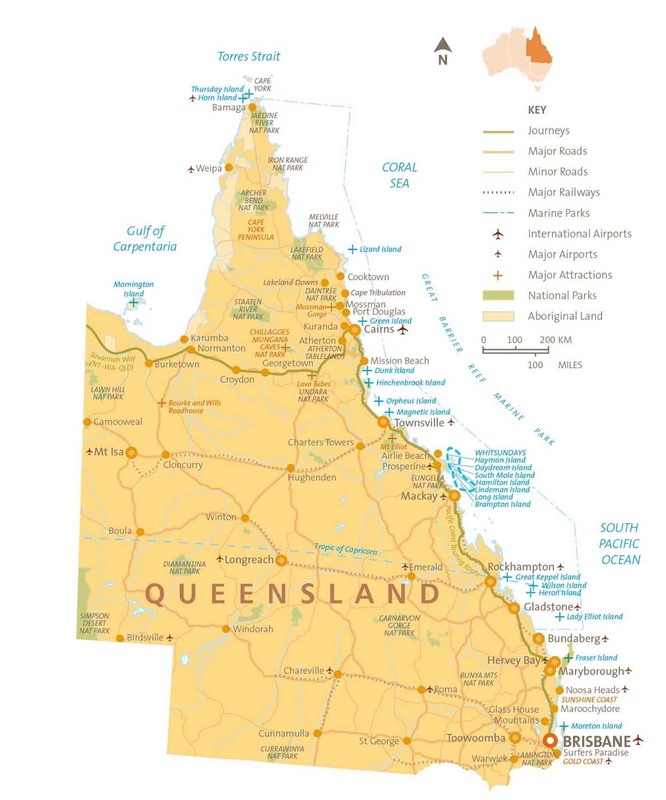 Beaches to bushland, cities and mountain ranges. We just love the volcanic peaks of the Glass House Mountains. Hiking the Pennine Way was never like this. At its southern tip the Great Barrier Reef fringes islands whose beaches make the perfect nesting place for turtles. Turns out, they’re the perfect nesting place for humans too. Enter a secret world of verdant rainforest, tranquil beaches and underwater marvels. Whatever you’re escaping from, the Tropical North Islands make a magical place to escape to. Four hours south of Townsville sit the Whitsundays, a collection of over 70 islands basking in the crystal waters off the Queensland coast. The capital is Brisbane in south QLD. Head south along the coast and you’ll arrive at the Gold Coast. Head north and you’ll reach the Sunshine Coast, the Whitsunday Islands, Cairns and the Great Barrier Reef. Off the beaten track: Drive the Capricorn Highway and explore gorges, rainforest and aboriginal rock paintings. QLD averages 300 days of sun a year (it’s not known as the Sunshine State for nothing) but sultry summer rain isn’t uncommon. Queenslanders are called ‘banana benders’ because non QLDers joke they’ve nothing to do all day but put the bends in bananas. Best not mention that, though. Get the latest travel tips and info straight to your inbox. Global Grapevine is the result of our many years spent travelling Australia. You can meet us here. We’ve criss-crossed the country countless times!